This roofing assembly involves torched applied layers of polyester and fiberglass reinforced SBS membrane. This roofing system is very durable but must be professionally installed. 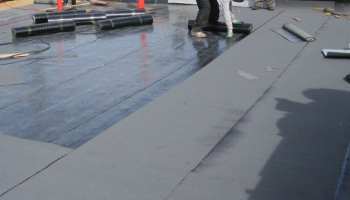 An improperly installed two ply roof will likely fail within the first two years of use, so applicator quality is one of the only sure ways to eliminate costly replacement. Easy to maintain if installed properly. Making a decision about a company to handle your Two Ply Roofing needs is difficult. Why not trust the company your neighbours have been trusting for two ply roofing since 1986?